It smells like I slaughtered a bison in my kitchen. Was I stirring up some satanic ritual? Nope, just cooking dinner last night. You would think that after 8 months of being a "stay-at-home mom" that I would have a handle on this whole housewifey thing by now. Clearly not. Yesterday morning, the sun came out for the first time in four days and I was up early, racing off to the supermarket with a list, envisioning a fabulous dinner that I would make for my husband before he would watch the Phillies beat the Dodgers and I would fall asleep, as usual, two hours before the most exciting game-winning hit in history. I decided to make meatballs. Now, full disclosure, I have a history with meatballs. Shortly before my wedding, my mother-in-law was kind enough to share with me her secret family recipe for Italian meatballs. I somehow ended up confused by the measurements and I drowned the meat until it crumbled into a runny bolognese sauce. My husband, two years later, still jokes with his mom that she sabotaged my efforts purposely, but we all know the truth; I have little patience for following a recipe meticulously (or perhaps at all). Which leads me to last night. I called my sister and told her, "I'm gonna make those Villa (di Roma) meatballs tonight!" "Interesting...." she laughed, foreseeing some dinner debacle. "Do you have all the ingredients?" she asked skeptically. "Yep, everything except parsley, . . . can I use chives instead of parsley?" "Are you kidding?" she asked incredulously. "Yep, I'm kidding, I'm a kidder, I kid!" I replied. "Oh my god, you're not kidding." I threw the chives back in the fridge and happened upon some dried parsley in my "spice cabinet." Woohoo. I was ready to rock. I had already averted a minor kitchen catastrophe with my dishwasher the night before . . . a catastrophe which I, of course, had created. 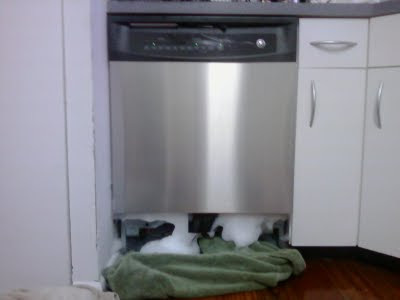 This photograph doesn't quite capture the rushing flood of bubbles, the several sopping wet towels, nor me on my hands and knees, calling my friend in a panic to ask (for the 2nd time in the past 2 years) what the hell you're supposed to put in the dishwasher to stop it from flooding. (Vegetable oil, in case you're wondering). I had also cleaned up the oatmeal that had exploded out of the top of my rice cooker yesterday morning. Now, I took Products Liability in law school and that was clearly no fault of mine, but rather a design defect. (You see, the lid does not fit properly over the cooking bowl, so oatmeal shoots out the top and flows like lava down the sides of the cooker). I put some neo-soul music on my ipod and started to get into a groove in my kitchen while my baby slept in his room. I was actually following directions, dicing onion and garlic (after my mom asked me if I knew what "dicing" meant over the phone; thank you very much, I do!). I slicked up my hands with olive oil and rolled what I thought to be the perfect meatballs, mixed with Romano cheese and bread crumbs and, for a brief minute, I felt like an up and coming Food Network star. Until I bathed the balls in olive oil just a bit too long, when the oil was simply not hot enough. (This I realize in retrospect). I even made my own tomato sauce, if you can believe that. And I was hopeful, so hopeful. Then I took a taste of one of the balls and ugh, spit it right into my kitchen sink. "It's not cooked enough," I tried to convince myself as I pounded a glass of water to cleanse my palate. "Once it soaks in that sauce, it will be perfect. Just like Villa!" I was positive. I took my little man out for an afternoon stroll around the neighborhood and let my balls and sauce simmer for hours. When we returned, there were no fires to put out, no suds seeping from the dishwasher any more, and it smelled phenomenal in my house. I snuck a taste of another meatball in the pot and ugh, I swallowed it with a grimace on my face. It tasted like meat drenched in oil. Vile. At this point, it was 5 p.m. and I was hoping for a miracle to occur in the pot before my husband arrived home from work. I was salivating at the sight of pureed peas, squash, and mango chicken I fed my boy, just thankful that he was not old enough to be subjected to his mom's creative concoctions. My husband walked in the door as I was stirring the balls with fervor, trying to put a spell on them. "It smells like my mom's house," he said, kissing me. "Yeah, well, it's not gonna taste like it!" I replied, spooning ziti and the oily balls into a bowl for him. I made one for myself too, hoping that he wouldn't grow suspicious. A quarter of the way through my bowl, I stood up abruptly. "I'm having cereal," I announced. "Don't think you have to finish that." Okay, so I made incredibly awful meatballs once again and ate Frosted Mini-Wheats for dinner for the second time this week. Does that really make me a bad housewife? Probably. After spending the better part of my day slaving away over the stove, I gave the baby a bath and laughed while he splashed me so much that when I emerged from the bathroom, it looked like I had just come off a log-flume. I'm sure a good housewife would never have taught her newborn baby to "splash, splash, splash" and encourage him to kick his feet as if he's pedaling in the Tour de France. But, after all, he could be the next Lance Armstrong or, with the way his legs glide through the bath water, Michael Phelps? I did manage to do one good housewifey deed today. I dropped off some clothes at the dry cleaners; in particular, I dropped off the clothes that I wore to a baptism on Sunday. You see, 5 minutes after sitting down at a table of almost complete strangers at the luncheon, I opened a bottle of formula, momentarily FORGOT that I had just unscrewed the cap and THEN proceeded to shake it all over myself, while the strangers shrieked in horror and immediately commented on how bad the formula smelled. Sorry, party people. What happened next, I'm pretty sure was exactly what that the priest had in mind when he babbled on about sin as I was forced to strip down to a skimpy tanktop while the strangers averted their eyes. A good housewife never would have been such a public embarrassment. I thought about crying. But instead I just laughed. And I laughed when the levees gave out on my dishwasher. And I laughed when oatmeal shot out all over my countertops and hardwood floors like Mount Vesuvius. And I laughed when my husband took a bite of my "Villa meatballs" that were really "Killa meatballs." And I laughed when I woke up this morning and it smelled like I slaughtered a bison in my kitchen. And, if I'm ever going to get this whole good housewife thing right, I think I gotta keep laughing.